Category Archives for "Miter Saw Reviews"
When choosing the best miter saw, reciprocating saws and other power tools one of the main question in most people’s mind is which saw is the best choice for you. Today the market is filled with a wide variety of saws, making it hard to choose the best model. Today we are going to look at one of the best miter saw available in the market that is going to make your life easier. If you are looking for a feature rich cordless miter saw that comes with a wide range of useful features, then the Makita XSL01Z LXT Cordless Miter Saw will exceed your expectations. This is one of the best miters saw that provides you with smoother cuts without many hassles. Let’s look at some of the features that make it a winner in its class. Powerful motor that delivers speeds of up to 2200rpm. Lightweight weighing about 27.5 pounds. Four steel rail sliding system. The Makita XSL01Z Miter Saw runs on an 18-volt motor that turns the 7.5-inch blade to reach speeds of up to 2,200-rpm. This motor will deliver enough torque to cut through plastics and lumber. One of the main benefits of this motor is very efficient when compared with other motors on the market. 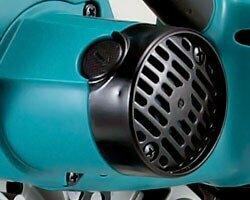 Additionally, this motor is designed for heavy-duty use, meaning that you will use it for long without any issues. 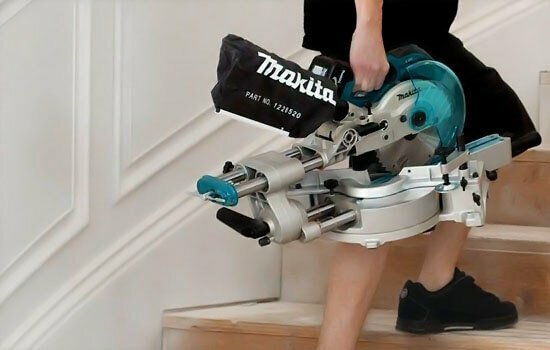 Another reason why you may need to consider Makita XSL01Z Miter Saw with Tool is its cordless nature. There are many reasons to consider a cordless model. First, you do not have to worry about not having enough room to maneuver the unit around the room. Secondly, you can still work with the saw in places where electricity is out of reach. Additionally, you do not have to worry about slicing through the power cord accidentally. This model runs on lithium ion batteries. 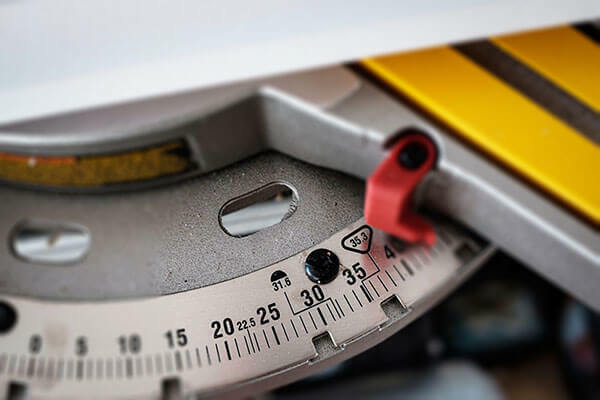 One of the main issues that many clients complain about when choosing the miter saw is the weight concern. Of course, you wouldn’t want to select a model that is heavy and clumsy as it would be hard to maneuver around the working space. With Makita XSL01Z LXT Cordless Miter Saw you do not have to worry about this as it comes with a lightweight and compact design. This model weighs only 27.5 pounds, which is relatively lightweight when compared to other models on the market. Besides making it easy to work with you do not have to worry about transporting it, as it is easy to carry from one place to the other. Additionally, storage is not something that should worry you. It will fit well in your cabinet and leave plenty of room for other tools. The Makita XSL01Z LXT Lithium-Ion Compound Miter Saw features with large lumber capacity that allows it to handle wood pieces that are longer and wider than normal sizes. With this miter saw, it is possible to cut 2 by 12 inches at 90 degrees and 1 by 8.3 inches at 45 degrees. The model also comes with a direct drive gearbox feature that allows for better cutting efficiency and easier maintenance. Most clients who have already purchased this model are happy with the performance of the four steel rail sliding system. The clients have reported that the system increases the rigidity for enhanced accuracy when making cuts. The steel construction also makes the rails super strong and durable. To make precise cuts, this model also allows you to make miter cuts ranging from 0-57 to the right and 0-47 to the left. In addition, this saw provides you with positive miter stops at nine settings that include 0, 15, 22.5 as well 45 degrees. The Makita XSL01Z LXT Cordless Miter Saw comes with a 7.5 blade. This blade is designed to handle smaller tasks, but you will be surprised with its performance even handling bigger tasks. The cutting speeds will not disappoint as it cut through wood and softer plastics easily. As previously mentioned, this model runs on an LXT lithium battery that provides impressive power and runs time. You are also provided with a 30-minute rapid optimum charger that enables you to charge the unit faster, allowing you to get back to work promptly. Another benefit that comes with the lithium-ion cell is that it discharges five times less than other batteries. 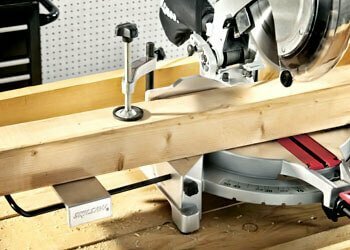 Compact and cordless design allows you to maneuver easily between your work benches. Offer you with a wide range of miter and bevel stops. Will cut through larger boards with its sliding saw head easily. Extremely lightweight making it easy to move around. Uses a high capacity lithium ion battery and fast charge charger that allows you to get to work quickly. This miter saw does not have a laser light guiding system. The main difference between the single bevel and double bevel is the operation mechanism. The double bevel compound saw is a better choice for inexperienced homeowners as it helps them to make bevel cuts on both sides without flipping the piece over, as it is expected when using a single bevel. Question: Is this saw compatible with the BL1830 batteries? Question: Do you know the “real” max high cut? (descriptions says 2″). Could it cut 2-1/4 square section or it won’t fit? Answer: Saw will accept a maximum of 4 1/2 square piece of lumber. Measured from base to the teeth of a 7 1/4″ cutting blade. Question: What size crown can it cut? Answer: It depends on how it is nested…I think it can cut around 8″ crown upside down and backward. It has been a great saw and has many unique features all of which have been a great help in our shop here at Fine Line. Using this miter saw is straightforward. You are provided with all the instructions you need to use it safely without injuring yourself. Additionally, the guide has all the instructions that you may need when doing the installations, making bevel cuts as well as the repairs instructions recommendations to avoid voiding the warranty. The Makita XSL01Z LXT Cordless Miter Saw is great for workers who do not want to be confined in their workshops. With this model, you do not have to carry extension cords as you can work with it anywhere you are. You will also love its compact design that allows you to work in tight spaces where it would be impossible to work on other full-size models. Plus, it will fit in any tool cabinet, so you do not have to worry about storage. Since it is a powerful, lightweight, and compact, it is bound to make your work easier. Sometimes it is hard to find the right tool for the job. Some types of equipment are too heavy; others will fall apart for no reason while other are just not powerful enough. If you are looking for the best miter saw that would do none of these things then the SKIL 3821-01 12-Inch Quick Mount Compound Miter Saw with Laser might be an ideal choice. This saw will take care of all sawing needs in an easy, accurate, clean manner. 15amp motor with the ability to produce 4500rpm. Comes with integrated carrying handles and a dust bag. Backed by one year warranty. The SKIL 3821-01 12-Inch Quick Mount Compound Miter Saw with Laser is a simple compound miter saw that is powered by a 15amp motor, which has the ability to produce up to 4500rpms. This means that the device will give you enough power to cut through most ordinary materials with precision. You will also love the fact that you can adjust the speed of the motor. This will allow you to reduce the blade speed to cut through soft materials precisely and increase the speed to cut through harder materials faster. This saw is best suited to cut through lumber although you can use it to cut pipes and plastics. Another special feature that comes with SKIL 3821-01 12-Inch Quick Mount Compound Miter Saw with Laser is the laser cutline guide system. This feature ensures that you have a preview of where the saw is going to cut through. This will allow you to make the necessary adjustments so that you can get the exact cuts as well as the angles you want. This feature is crucial for both advanced users as well as novice users. Even if you have minimal skills in doing DIY project, you do not have to struggle when making angled cuts. This feature will also allow the experienced users to make precise cuts faster. The SKIL 3821-01 12-Inch Quick Mount Compound Miter Saw with Laser detent plate is equipped with nine positive stops which give you with the stability you need when cutting through wood and other materials. This will allow you to adjust the saw easily to get precise cuts quickly. Additionally, the nine positive stop will allow you to make common miter angle quickly. These stops are provided at 0, 22.5, 31.6 and 45 inches both on the left and the right side. The miter angle will allow you to set the blade from 0-47 degrees. 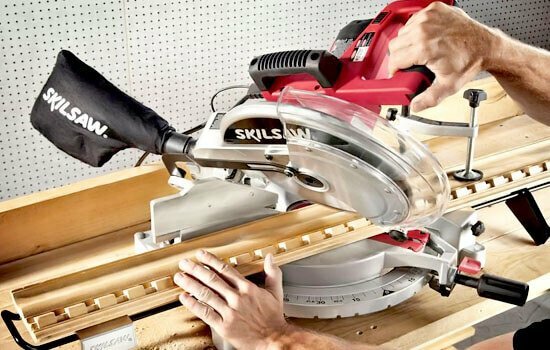 The SKIL 3821-01 12-Inch Quick Mount Compound Miter Saw with Laser also features table extensions that will allow you to have enough space especially when working on longer and larger workpieces. 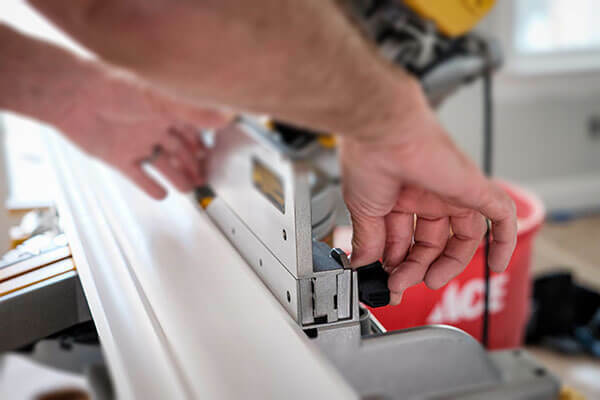 You can also take advantage of the quick mount system that is designed to make it easy to install on the SKIL miter saw stands. Another reason why most individuals prefer this model to other miter saws on the market is its affordable price. This machine is going to provide you with everything you need to accommodate your cutting needs. 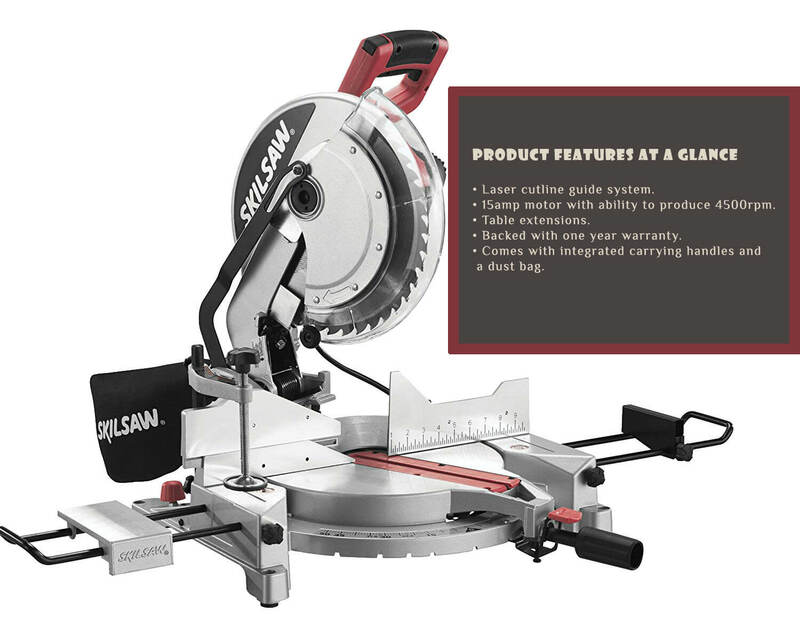 The SKIL 3821-01 12-Inch Quick Mount Compound Miter Saw with Laser comes with a number of unique features that are hard to find on other product at the same price range. First, this model comes with an effective dust bag that will allow collecting the dust. This means you will leave the working place clean as you found it. Weighing a total of 51.6 pounds, this miter saw may be difficult to transport without a tool cabinet. To help you in moving it from one place to the other, this model comes with a tool box that has integrated carrying handles that allow you to transport it from one place to the other. If you are searching for the best miter saw, you probably want to know the major difference of Miter Saw Single vs Double Bevel. One of the main differences is that with the dual bevel compound is that unlike the single bevel miter saw you do not have to flip the workpiece to make bevel cuts on the both sides. This makes it a great tool for inexperienced homeowners and professional users who would like to make work easier. Comes with user-friendly features making it easy to use. Comes with a laser guide that helps you to make accurate cuts. Features a dust bag that helps to collect the dust. Comes with 9 positive stops that enhance its stability. The clamp is a great feature. Simplified design means it lacks advanced features such as LCD screen design. Question: Can this be mounted on existing wooden workbench? Answer: Yes it can be mounted to a wooden bench – it is much more versatile on a sturdy portable stand. Question: Can the 12in compound miter saws cut a 6×6 post? Answer: The maximum cutting capacity at 0/0 is 4X6. Question: How easy is it to change the angle for a bevel cut? Do you need to have a tool or is it just simply pushing or pulling a button? Answer: DLoosen a knob, turn the head to angle and re-tighten. I have used this saw extensively on several projects including a new bathroom vanity. Love it and works well with the Skill stand. Have had no problems in operation – the laser alignment thing is very handy and saves a lot of time. A vast improvement over my old Craftsman. 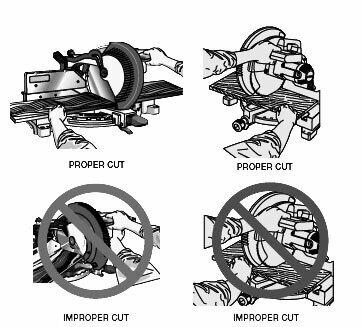 The SKIL 3821-01 12-Inch Quick Mount Compound Miter Saw with Laser comes with detailed guide instructions that allow you to use it safely. The guide covers the installation steps, illustrations of making bevel cuts as well as the safety instruction to adhere to. You are also provided with the instruction of repairs to avoid voiding the warranty. All in all, SKIL 3821-01 12-Inch Quick Mount Compound Miter Saw with Laser is a highly reliable and powerful miter saw that is effective in cutting any type of wood with great accuracy and precision. Another thing that makes users immediately like the miter saw is that it comes with a relatively low cost. We would recommend this product to any budget conscious user who is looking for a high quality yet affordable miter saw to help him in his woodwork projects. When it comes to durability and ease of use, you may never find another sliding saw better than the DEWALT DWS709 Miter Saw. This compound miter saw provides a perfect combination of great power and efficiency, helping you to complete different woodwork projects effortlessly. It revolutionary compact and ergonomic design also makes it one of the best miter saw and an indispensable tool for the modern day artisan. Does this saw sound like a model that interests you? If this is the case, take your time to read our review to get all the information you need to know about the product. Features a strong 15 Amp motor with the ability to produce 3,800 rotations per minute. Features a unique back fence design. Comes with a durable stainless steel miter plate that is adjustable. Professionals and avid DIYers love the DEWALT DWS709 Slide Compound Miter Saw because of its lightweight and compact design. This product weighs around 50 pounds, making it easy to carry to the job site. Additionally, its lightweight design allows you to have less arm fatigue, enabling you to work for a long period without any problems. Another reason that makes this miter saw a favorite model amongst woodworkers is that it is more compact that you would imagine for a full size sliding compound miter saw. This means that you will store it conveniently in your toolbox for secure storage. In addition, you can carry it to the job site easily using your tool cabinet. 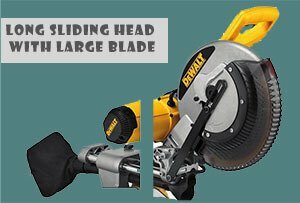 One of the biggest advantages of the DEWALT DWS709 Slide Compound Miter Saw is the sliding head. It allows you to cut large pieces of wood that would be otherwise hard to cut when using other miter saws. This model combines its sliding head ability with the large 12-inch blade allowing you to have even more reach. With this best miter saw, you can cut lumber that measures 2 by 14 inches when positioning your machine at 90 degrees. At an angle of 45 degrees, the saw cuts lumber measuring 2 by 10 inches. The DEWALT DWS709 Slide Compound Miter Saw comes with an adjustable miter detent plate that features 13 positive stops that improve its productivity. The stainless steel gives a lifetime practicality, meaning that the saw will give you a service that you can depend on for many years to come. Additionally, this miter saw comes with a precisely machined base support as well as a miter system that will optimize the cutting accuracy for you for efficiency. 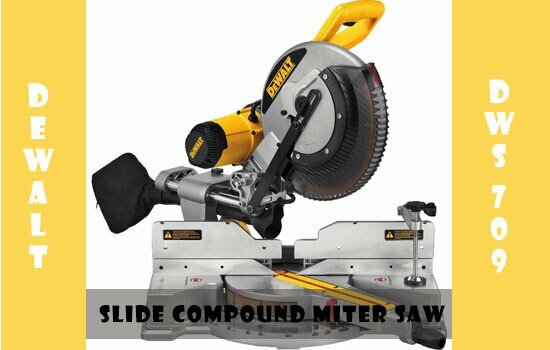 Another reason why you may consider purchasing this miter saw is the large back fence that allows you to hold your base molding against easily while allowing you to work with anything that measures up to four and a half inches high. When you are making the bevel cuts, the back fence will slide away easily allowing you to make accurate cuts. This feature also allows you to cut crown molding to up to five and a half inches high. In the same breath, you can make sure that the straight edges are sitting flush as you can adjust its position between the adjustable fence and twist to tighten. The DEWALT DWS709 Slide Compound Miter Saw also features a large bevel scale making it precise and easy. The oversized bevel means that you will never have any problem when it comes to making angled cuts. This feature allows you to make accurate cuts even when you are not looking directly on it. The micro adjustment also allows you to make cuts that are more accurate. On the other hand, unlike other miter saws that leave a lot of mess on the job site, you do not have to worry about this as it comes with a dust bag that collects all the debris, meaning that you do not have to have a lot of difficulties when cleaning the work area. – Compact and attractive design. – Easy to operate making it a perfect choice for both professional and novice users. – Sturdy construction making it durable. – It is lightweight making it very portable. – A bit costly but it is definitely worth it. Question: Is this unit a double bevel? Question: Can you install the led system on thi model? Answer: NO WAIT! Double-checked and DeWalt’s website has a “list of compatible models” that includes this saw. BUT the list then gets into “types.” If you decipher it more carefully than I did the first time, it’s clear that the DWS709 is NOT compatible with the 7085 light system. I would suggest contacting Dewalt directly. 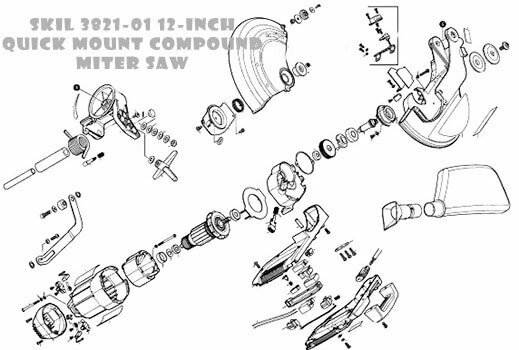 Question: What is the depth of this saw if I was to use on a bench? Specifically, what is the clearance required for the saw? Answer: Depending on whether you use the existing dust bag or using a vacuum system. If using the existing dustbag about two feet behind, if hooking to a vacuum system, that would depend on the type/size of the house. Ive only used for a few days but I’m impressed. Years ago I chose the Dewalt 12″ miter because of the cost of the sliding miters which at the time was in the $700s. Today to be able to buy a sliding miter, especially a 12′ sliding miter of this capability is living the DIYers dream. Using the DEWALT DWS709 Slide Compound Miter Saw is rather simple. You are provided with a step-by-step guide that has all the instructions that help you to use the saw effectively and safely. The guide also has illustrations that show you how to make bevel cuts easily. 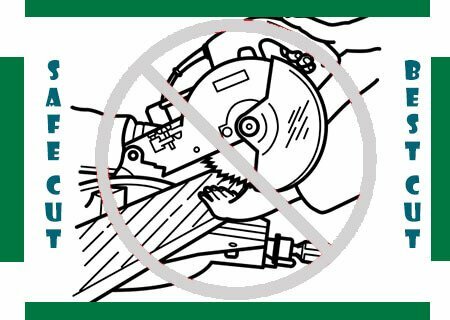 You are also given all the safety instructions to adhere to while using the saw. Make sure you go through the manual well before using the saw. 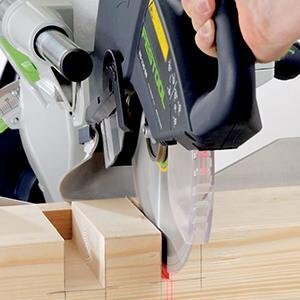 If you want a smooth cut, you need to choose a miter saw that offers you as much power as possible. 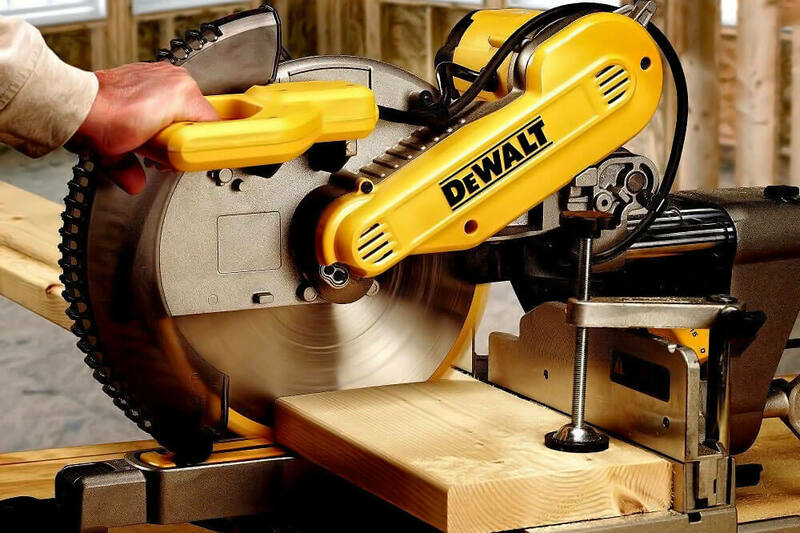 The DEWALT DWS709 Slide Compound Miter Saw comes with a 15-amp, 3,800 RPM motor that does not only provide you with sufficient cutting power but also lasts for a long time even with heavy duty use. Whether you are an expert or a beginner, look no further as this model offers you with brilliant functions that make it a great addition to your tool collection. This saw cuts precisely; slides smoothly, adjust comfortably, and lightweight design making it easy to use for long durations. 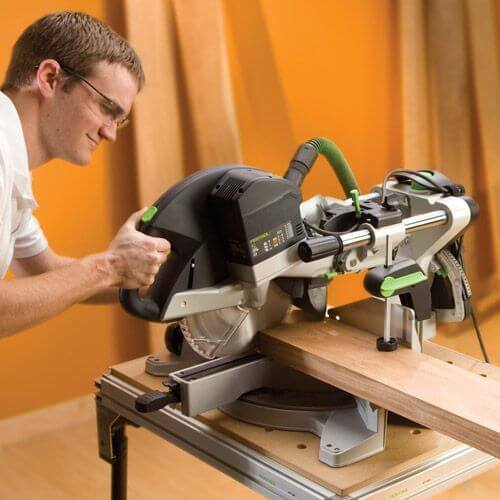 When looking for a good miter saw, you can never go wrong with the Festool Kapex KS 120 sliding compound miter saw. This saw provides the construction workers, carpenters, and homeowners with an accurate way of cutting lumber effortlessly. 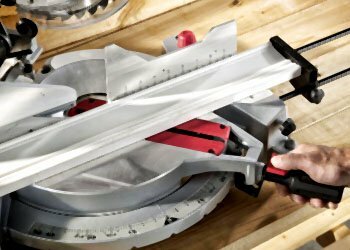 By combining a bevel cut together with a miter cut, this compound miter saw surpasses the capabilities of conventional miter saws. These are just some of the features that come with this model. 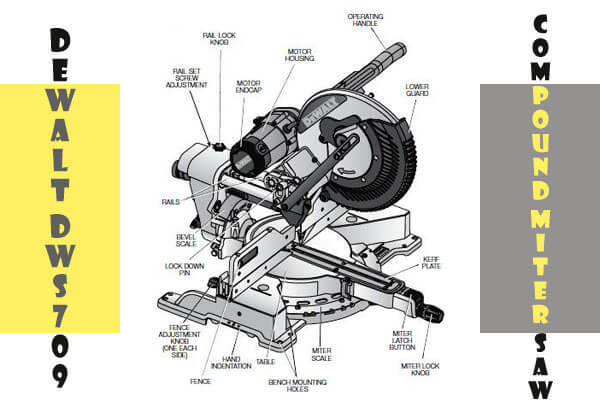 This guide will look at some of the other features that the saw has to offer for you to determine whether it is right for you. 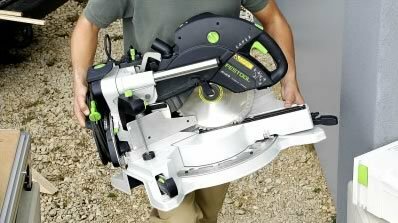 The saw is fitted with a 1600 watt drive motor that produces excellent torque to cut lumber quickly. The saw also comes with a magnetic brake that will reduce the period of time used to stop the blade. This impressive safety feature reduces the risks of injuries to the users. The saw also features two stage trigger as well as soft start motor that have steady speed monitoring feature. 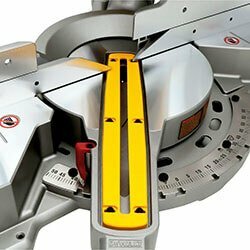 The speed-monitoring feature ensures that the saw maintains a consistent speed when cutting different types of materials. We find this saw powerful and efficient as it comes with a variable speed feature that allows you to adjust the speed from a minimum of 1400 to a maximum of 3400 rotation per minute. Another feature that stands out in this saw is the durable design. 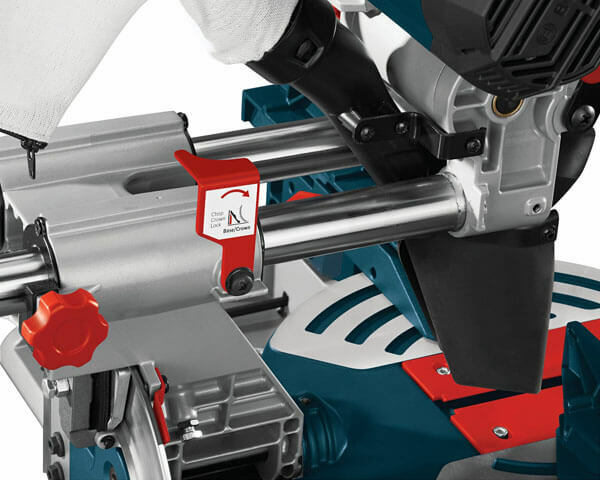 This saw comes with a space saving, sturdy and forward rail design. The forward rail design allows you to make precise cuts without much straining. Additionally, this model comes with a magnesium allow base that is not only sturdy but also lightweight. This makes it easy to carry the saw to the job site. Unlike other miter saws, this model also features two-handle setting at the base of the saw. This means that it is close to your core strength and this play a major role when it comes to the reduction of the injury risks. Most reciprocating saws on the market come with one laser, making it hard to make precise cuts. 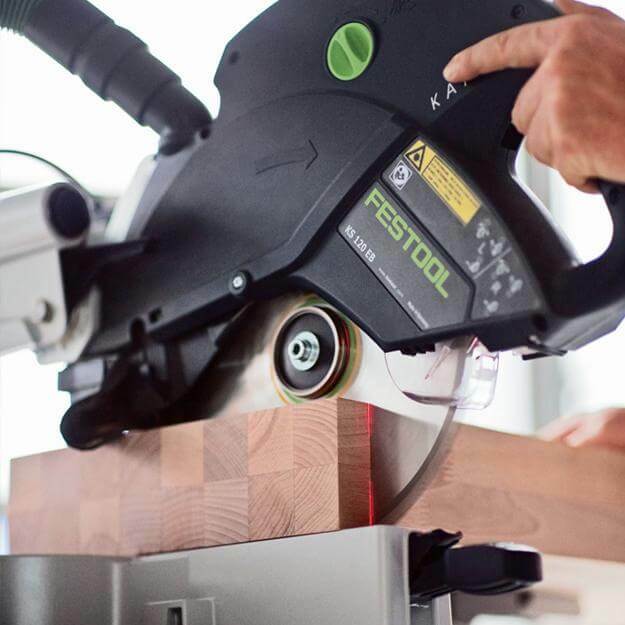 To correct this, Festool Kapex KS 120 sliding compound miter saw features two lasers that assist you to cut more precisely. The double lasers allow you to align your cuts from both sides of your saw blade. 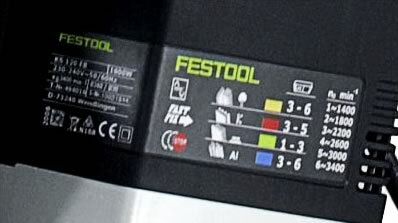 This makes it easy to fine-tune the lasers as you can use the three axle adjustment controls that come with the saw. The manufacturer has installed an easy to use that lets you turn the lasers on and off without having to switch the saw off. In addition, the dual lasers will not require batteries as they are powered electrically. Most of the miter saws on the market use batteries to operate their lasers. The Festool Kapex KS 120 sliding compound miter saw comes with specially designed slim kerfs blade that reduces both the noise and vibration. The model also allows for specific cutting positions as it allows the use of blade’s back portion more efficiently. Additionally, the scale allows you to make cuts at angles of up to 60 degrees on the right and 50 degrees to the left. Additionally, you can use this model to cut trenches including notches for lap joints or pipes. Another reason why you may need to consider purchasing this tool cabinet is portability. 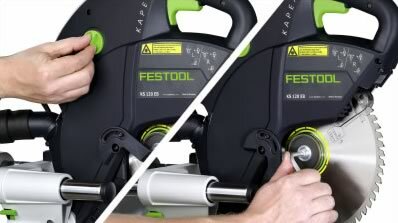 The Festool Kapex KS 120 sliding compound miter saw comes with a lightweight and compact design. Comparing it with other miter saw in the same price range, this is one of the best miter saws that are easy to move around as well as easy to store. The head of the saw locks when not in use, making it compact. This means that you can store it in tight spaces such as a closet when not in use. Since it comes with a rail forward design, you can also store it against a wall. 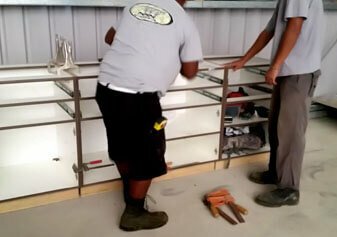 This will help you to free more space inside your workshop. 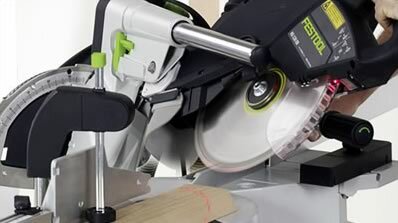 Using the Festool Kapex KS 120 sliding compound miter saw is rather simple especially if you follow all the instructions that available in the manual. This information will help you to make precise cuts easily while still ensuring that you are safe. 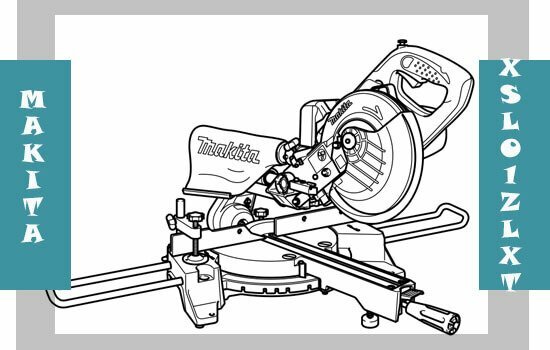 Additionally, the manual comes with all the maintenance tips to keep your saw in top performing condition for long. 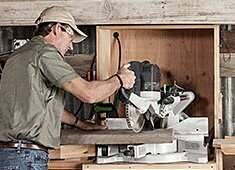 The Festool Kapex KS 120 sliding compound miter saw utilizes modern technology, making it fast, reliable and easy to use. The model also comes with impressive features that play a major role lining it up with the cuts for more effectiveness. Additionally, this model comes with many innovative features that allow you to make perfect cut after another perfect cut. Looking at the features that it comes with, this is one of the best miter saws on the market that we can recommend to anyone who is looking for an effective, durable, and easy to use model. For me, few things are as exciting as the first moments you spend with a Highly-anticipated new tool. Would it perform as well in House as the demonstrations and previews we witnessed? Would it help us get work done faster, or with more efficiency or capacity? The Bosch CM12SD Dual Bevel Slide Miter Saw is a very good quality miter saw with many features and access to some great accessories. The motor is plenty powerful and should be able to stand up to the rigors of everyday use. To be effective, a 12″ miter saw has to be two things above all else: accurate and powerful. Once you have that figured out, you can build sliding and beveling around your solid foundation. If you’re one of the companies that have managed to figure it out, you just don’t change it up often. Bosch tackled the issue of vertical clearance with this model in an effort to really push the value for trim carpenters installing larger crown molding. They moved the motor a little bit in order to create more clearance. They also added a crown molding chop lock stop (say that three times fast!). This feature simply swings into place to stop the slide at the exact position offering the most clearance for cutting crown. Lock the slides once you’re against it, and you have 6-1/2″ nested crown cutting capacity and 6-3/4″ base capacity against the fence. The 4-3/4″ sliding fences provide excellent support for a wide range of material lengths, including the crown molding that this saw is designed to maximize. A pair of base extensions offers to support up to 40 inches. These extensions are a welcome addition if you aren’t planning on using a miter stand. The Bosch CM12SD came out of the box in pretty good shape. The miter and right bevel were each about 1/4 of a degree off. Miter adjustments haven’t really changed. Positive stops on all the popular angles are solid and easy to find. 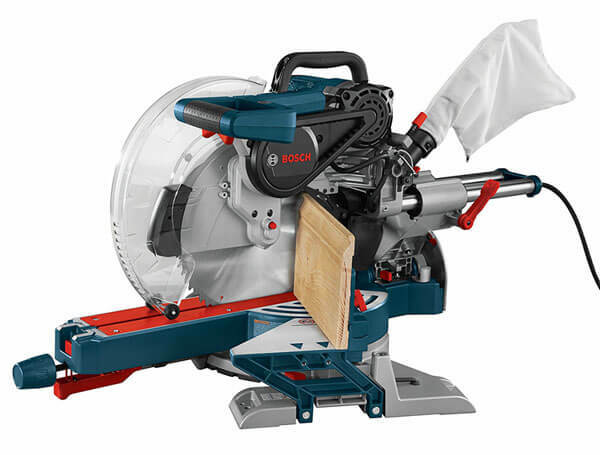 At 0 degrees, this Bosch 12″ compound sliding miter saw offers 4 x 14-dimensional cutting capacity. Miter over to 45 degrees, and you’ll still have enough room to cleanly cut through a 4×10. Thankfully, Bosch Hasn’t messed with their bevel lock. It’s one of the few that are on the side of the saw within easy reach. 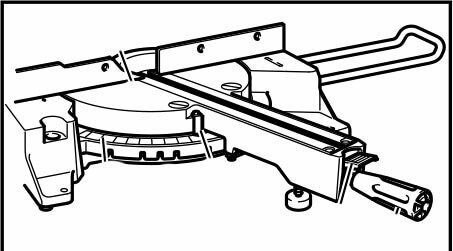 One of the relatively new features (and completely new on this 12″ saw) is the rotating turret bevel stop (there’s one on each side). Rather than having a mechanism slip into a decent like the miter stops, you simply twist the bevel stop to the degree you need it on either side. On the right, you’ll need to pull a plate back that acts as the 0 degrees stop in order to continue your bevel. 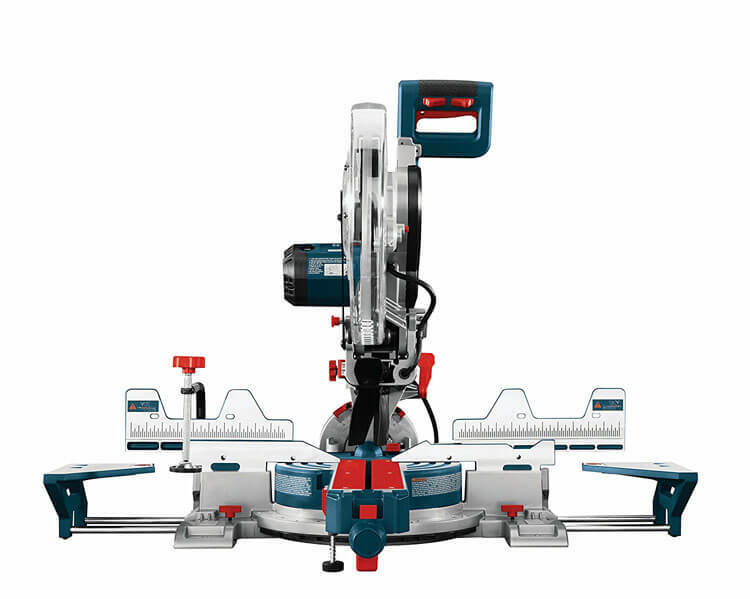 The Bosch CM12SD is like most 12″ miter saws on the market—it has a 15 amp belt-driven motor. The Bosch CMD12SD motor is certainly powerful enough to make any cuts you’re likely to come across. The stock blade is solid, but there are better 12-incH thin kerf miter saw blades out there if you want to upgrade. If you’re doing general construction, the stock blade will work fine, and the quality of the cut was good for basic trim work. One thing Bosch does well that other miter saws often gloss over are on the positive miter stops. If you don’t have the override lever engaged, you’re going to slip into the next miter stop you come across and go no further. This isn’t the case in other saws that allow you to kind of click-and-go over the top of the stops if you’re quick enough. It’s not a make or break kind of issue, but it does promote confidence in Bosch’s build quality. Ergonomically, the Bosch CM12SD is a monster saw. Its weight can be attributed to the amount of steel used in the design, which is a great thing from a build quality standpoint. I’d highly recommend the Bosch T4B miter saw stand if you want to haul this saw around to and from job sites. The gravity rise stand is one of the best designs we’ve ever seen. Its wide wheel base keeps your saw from wanting to tip over when transporting it across uneven ground and it fits perfectly in a small enclosed trailer or in the back of a truck. Given the fact that you can collapse and deploy it from a standing position, your back will thank you every time you use it. By comparison to other miter saws and compound miter saws on the market, it is affordable. Yet, at this affordable price, it will save on the problem of lugging around different saws, or attempting to size trim when the old bulky saw is down three flights of stairs and the room being fitted with trim is upstairs. With this compound miter saw you can eliminate any guesswork, and ensure accuracy into the angled cuts, right from the first cut. That is an odd way of thinking of this 65 pound saw, but it has been a pleasure to use over the last few months. I have replaced the saw that was on my mobile stand with this unit because of how comfortable it is to use. For workshops, the Bosch GCM12SD Axial-Glide System might fit better, but owning that saw also makes me appreciate the bevel adjustments of the CM12SD. The bevel locking lever gives me more confidence on this saw. They do share a few similar features, but I like the accuracy and adjustability on this saw. The biggest complaint was the dual slides of the saw that stick when retracted. With dust collection and a slight change to the handle Height as my only suggestions for improvement, it’s easy to recommend the Bosch CM12SD 12″ miter saw to any professional. You’ll get the power you’re used to and maybe more compared to the other 15 amp saws. Where this model from Bosch really stands out is in its build quality, accuracy, and deep cut capacity. Bosch CM12SD 12″ Bevel Slide MiterBuy on amazon now!